The Apple Watch is a polarizing device. You either love it or hate it. Either way, you probably need to get used to seeing it around. 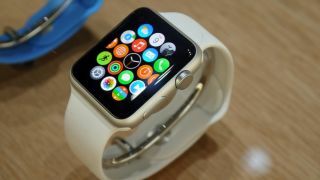 With more than 3000 apps available, Apple has developed a ton of utilities for Watch wearers. Included in this long list of apps are several business-focused tools that aim to help improve productivity, organization and communication. We've narrowed the list down to some of the most important ones available, and we'll be sure to continue refining as the list expands. You can't have an enterprise-ready device without somehow tying it back to Salesforce. In partnership with Apple, the CRM giant created a tool, Analytics Cloud for Apple Watch, that offers users the ability to analyze and take action on data. Users can swipe from dashboard to dashboard to explore real-time data, and perform voice-based search to bring up reports and dashboards. Additionally, Salesforce1 for Apple Watch is built to provide notifications to employees. Managers can send updates to their teams via the Watch to let them know when goals have been reached, when emergencies have occurred, or when it's quitting time, among other uses. If you're willing to do the leg work, and you're a Salesforce customer, you can use the Salesforce Wear Developer Pack to develop your own apps that tie back to Salesforce's reporting. Want to step out for lunch, but you're afraid to miss that important client call? Unified communications specialist, ShoreTel, has developed a tool that will route your desk phone to your Apple Watch so that you can hear voicemail, transfer calls, and conference into meetings. You can also program the app to let you view and respond to unread instant messages, receive meeting notifications, and more. Now you can be "unreachable" on your watch too! If you're one of those managers that likes to be in touch with your employees at all times, Betterworks has developed an app for the Apple Watch that is designed to help teams track and achieve goals. Managers program assignments into the app, where everyone on the team is able to use their Watches to track progress (or lack thereof). Users can also message one another from within the application. Similar to Salesforce, but designed for smaller businesses, Bottomline is a sales tracking tool that gives business owners the power to monitor sales, customer requests, inventory, and more. You can also view PDF dashboards on the Watch so that you can better understand which products are outselling others, which stores have more foot traffic, and which salesperson sold more goods, among other uses. For consultants and other hourly workers who have a hard time managing when they started which job and when they clocked out, Invoice2go has created an Apple Watch application that lets you clock in and clock out of jobs via your wrist. The Watch app also notifies you when payments have been processed, so you don't have to constantly check in with your clients' grumpy payroll managers.